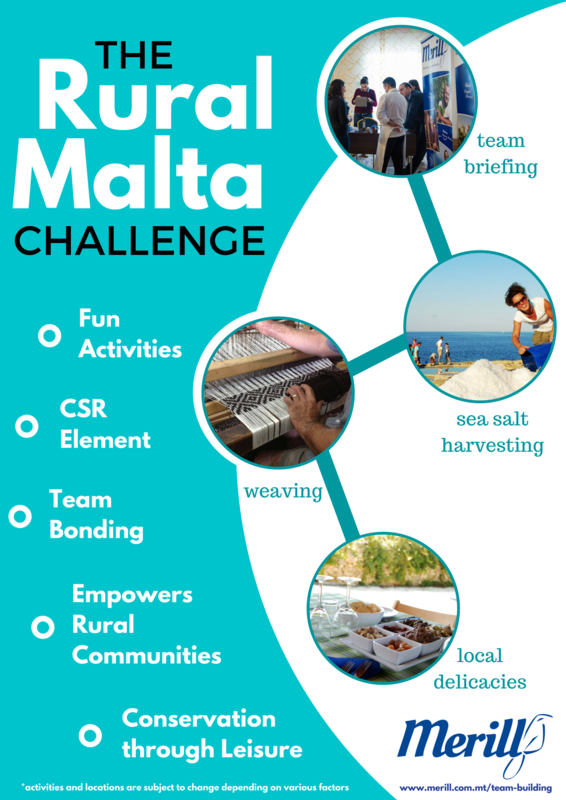 Organise a Team Building event with a difference; Motivate your team while contributing towards the rural landscape of the Maltese Islands! Spending a couple of hours in Malta's rural and natural areas can go a long way towards energizing your team through innovative and meaningful activities. Our packages are designed to embrace the rustic, authentic agricultural elements while delivering a comfortable and quality-assured experience. Harvest, Pick & Taste - Delight your senses while picking your own seasonal product. An hour with the Masters - Let our artisans help you discover hidden talents. Rugged, Raw & Rustic - Become one with nature while you spend time honing in your farm estate skills. Summer also brings along new adventures. The main activity this season is sea salt harvesting! Is your team up to it? Or treat your people to our full-day package! Email us on info@merill.com.mt or call on 99443118 for more details.